Among the editorial boards of the top 40 newspapers in Texas, only two have endorsed Donald Trump for president. While recent polls suggest Republican Donald Trump is just a few points ahead of Democrat Hillary Clinton among Texas voters, the presidential race is far more lopsided among the state's leading newspapers. On Nov. 6, the editorial board at the Lubbock Avalanche-Journal rallied behind Trump as well, giving the Republican presidential nominee the biggest newspaper endorsement in Texas yet just two days before the general election. “Trump is serious about his love for this country and his ability to lead. That became clear when he made the solid choice in Mike Pence as his running mate and when he listed several impressive conservative judges as possibilities for the Supreme Court,” the Avalanche-Journal's editorial board wrote. 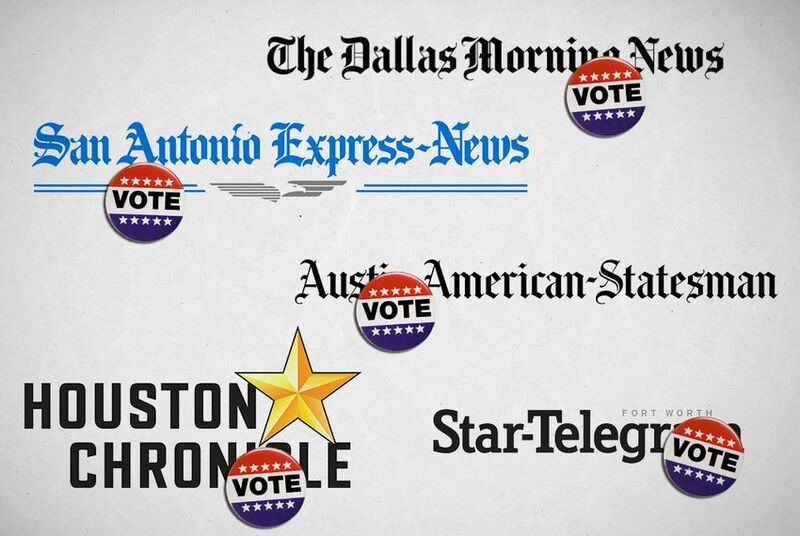 Meanwhile, several of the state's largest papers — including the Dallas Morning News, Houston Chronicle and San Antonio-Express News — have endorsed Clinton. The Dallas Morning News endorsement drew national attention as the newspaper's editorial board noted it had not endorsed a Democrat for president in more than 75 years. Several other Texas papers, including the Austin American-Statesman and the San Angelo Standard-Times, have said they will not endorse in this year's presidential race. On Friday, the Fort Worth Star-Telegram’s editorial board took the unusual stance of recommending voters reject Trump but abstaining from endorsing any of his opponents. Despite strong editorial board support for Clinton over Trump, that has not translated to such uniform support of Democrats down-ballot. Both editorial boards at the San Antonio Express-News and the El Paso Times endorsed the re-election of U.S. Rep. Will Hurd, R-San Antonio. Hurd's heated rematch against Democrat Pete Gallego has emerged as the state’s most contested congressional race. Nationwide, over 150 newspaper editorial boards have endorsed Clinton, Business Insider reports. On Sunday, the Las Vegas Review-Journal editorial page endorsed Trump, the largest newspaper to do so. Editor's note: This story, originally published on Oct. 25, has been updated to add the Lubbock Avalanche-Journal's Nov. 6 endorsement of Donald Trump. Texas Republicans would lose seven committee chairmanships if their party loses control of the U.S. House. Even with the presidential race closer than normal, Democrats have little chance to gain ground in the Republican-dominated Texas Senate. Did you have any trouble voting? Text us your experience by joining the ElectionLand project. We'll check in to find out how long it took you to vote and whether you had or saw any problems. Sign up now by texting TEXAS VOTES to 69866.